Our puppies are in general always black-brown. They are lively, friendly, healthy and well socialized. Usually the puppies are almost completely black, when just born. The final colors show only when the dog has grown up. Every year we try to breed a couple of litters. When we expect a litter, we will make an announcement on our site, and in the duch VDH magazine. We keep the puppies and their mother with us in our home. This way, we can always closely observe mother and puppies. We give all puppies very much attention and care, until they go to their new owner. De breeding females of Jabora will in general get their first litter when they are two to three years old. This depends on how fast the female is growing into an adult dog. 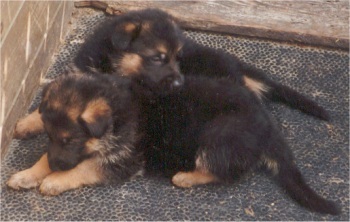 We think that the female should not get her first litter until she is mentally and physically ready for it. Every year we make a breeding program, and select the females we want to use. Then we search for a sire that fits her best, and can contribute in a positive way to our blood line. The female will not get more than one litter in 18 months. When she reaches the age of 6 or 7 years, she can enjoy a well deserved retirement. This certificate will only be handed out to litters of which both parents have been surveyed and recommended for breeding. During the breed survey, the dog will be measured, weighed, and anatomically analyzed in the stand position and also, when in movement. Based on each dog’s overall evaluation, it will be awarded the predicate Class I or Class II. Of course, not all dogs will be able to reach the level of these certificates. The requirements to enter a dog in the breed survey event are not easy to achieve. They must be absolutely healthy, and must have successfully completed an endurance test, received a rating of at least “good” in a breed show, they must have obtained at least a performance title of SchH 1 and must have certified hips. This may seem to be very restrictive, but it makes sense since we are looking for animals within our whole breed population, which have been selected based on their temperament, performance, and anatomy to improve and advance the breed.